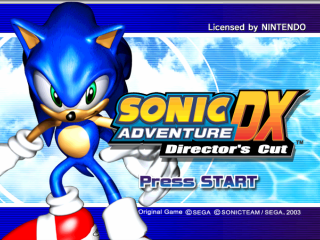 Sonic Adventure DX: Director's Cut, known as just Sonic Adventure DX (Japanese: ソニックアドベンチャー DX(デラックス)) in Japan, is an enhanced port of the Sega Dreamcast game, Sonic Adventure, with many added features and updated graphics. It was first released for the Nintendo GameCube in 2003, followed by a Windows PC port the following year. 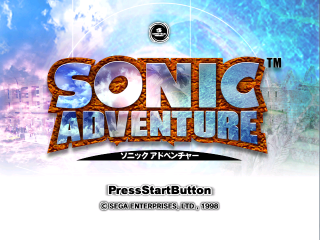 Sonic Adventure DX follows in the footsteps of Sonic Adventure 2: Battle, a GameCube conversion of Sonic Adventure 2, released in the tail-end of 2001, taking a Dreamcast game (in this case 1999 releases (i.e. the Western and International versions) of Sonic Adventure and attempting to enhance the game for the more capable GameCube hardware. 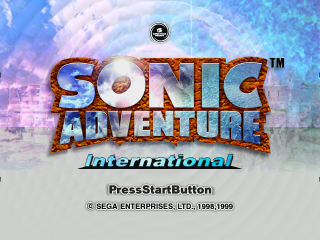 Unlike Sonic Adventure 2: Battle, however, the changes in DX are far more significant, resulting in a graphical overhaul across most areas of the game, a new "mission mode", an enhanced Chao Garden and the inclusion of 12 unlockable Sega Game Gear titles. 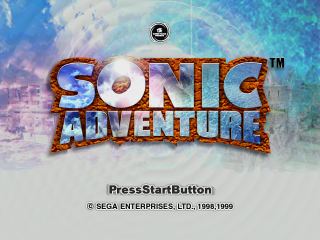 It pulls a lot of inspiration from Sonic Adventure 2, while attempting to fix some of the multitude of problems with the original release, and is generally considered by Sega and Sonic Team to be the definitive version of the game, being the basis for all conversions going forward. Much of the game has been remodelled or re-textured, with the main characters being among the assets to be re-created with higher polygon counts. But while DX may improve on some 3D geometry, much of the game is untouched and some areas, such as the in-game lighting model and many of the texture choices, are often considered to have been downgraded. In many parts of the game, particulary areas in an around Station Square, these texture changes lead to a very different looking world as seen in the original Dreamcast release. Sonic Adventure DX being the better version of the game, as is its design, remains a contentious issue among fans. Enhanced graphics: Sonic, Tails, Knuckles, Amy, and Gamma were re-created with higher polygon counts, resulting in smoother models. For some reason, Gamma was not recreated, and Big's new model is barely noticeably different. The GameCube's TEV system, similar to nVidia's register combiners, was also used for effects like rippling water. (These effects are not present in the PC version, however). The PC version has the option to remove some smaller objects or effects from stages (like the fire hydrants in Speed Highway's At Dawn segment) to improve performance. The original palette-based lighting system (Lantern) has been replaced with simpler lighting. Very many changes have been made to textures throughout the game, ranging from minor to completely different; an example on the minor end of the spectrum is that the train used to transport from Station Square to Mystic Ruins is now blue instead of red, and on the major end of the spectrum, Twinkle Park can look like a different level at times. A detailed look at these changes (among others) can be seen at PkR's Dreamcastify WordPress site. The game runs at 60 frames per second. Unfortunately, the framerate is generally unstable and frequently dips below 60fps, even in areas that do not seem to be graphically complex (framerate stability problems are not present in the PC version, assuming you meet its recommended system requirements). Cutscenes are locked at 30fps for a "cinematic feel", and to preserve the original script timings. Some sound effects, such as when collecting rings and emblems, are lower in pitch. A "Free Look" camera option was added, allowing the user to reposition the camera with the GameCube's C-stick. This option is reset to Sonic Adventure's original "Auto Camera" setting every time the game loads a new map. Changes (mostly minor) were made within the levels themselves in an effort to help solve some of the game's problems concerning collision detection. However, many glitches were not fixed. New glitches were introduced, related to inconsistencies in the port (for example, some windows still reflect the original Dreamcast graphics). The Internet connection feature was removed. Some of the downloadable content from the Dreamcast version was included with the GameCube port. A new Mission Mode is available, similar to the Mission Mode found in Sonic Jam's three-dimensional Sonic World. It features 60 missions spread across the six playable characters, where special tasks must be completed in the game's Adventure Fields and Action Stages. Metal Sonic becomes a playable character in Trial mode, as a reward for collecting all the Emblems. Cream the Rabbit makes several cameo appearances during the main game and Mission Mode to guide the player: for example, when finding the "Ice Stone" after Casinopolis Action Stage and when E-102 "Gamma" first goes to Station Square. The ability to skip cutscenes by pushing was added. Map option available by pausing the game in Adventure Fields. Some voice effects were changed like when Tails begins to fly or when Amy swings her hammer. The ability to have a clear pause screen by holding and was removed. Note: The following comparisons will be moved to the Comparisons page once completed. The "PRESENTED BY" text above the SEGA logo uses a different font and the trademark symbol was changed from '™' to '®'. The Sonic Team logo is now a static screen, rather than being part of the intro movie. The game's sound credits were moved from the end credits to an additional screen appearing after the Sonic Team logo. The memory card screen was changed to accomodate for the GameCube. Rather than eight possible slots, there are now only two. This lowers the max possible file count from 24 to 6. The file select screen now displays the selected memory card alongside the files. The game's logo was completely redesigned for Director's Cut. The cork-board and mirages were replaced with something a bit clearer and more generic. The intro movie was modified accordingly to include it. The title screen was totally redesigned. The Dreamcast version focuses on the game's logo, with pre-rendered mirages of Station Square and an unknown castle-like structure in the background. The background may or may not feature animated ripples (see the original game's regional differences). On the other hand, Director's Cut features a large pre-rendered 3D Sonic next to the logo with scrolling clouds in the background. The Subgame version has a number of incorrect textures. The game no longer crashes on the Subgame if you're not Amy. Removed Sonic's Act 1 leftovers in Big's Act 3. The skybox is properly centreed around the player. The water effects move up and down instead of actual waves appearing. The water also isn't a part of the skybox anymore. Palm trees with Kikis on it are shorter. The Kiki on the first bridge was moved to the centre. The unused tumbleweed object has a lighting bug. A lot of Act 1 Textures are slighty darker. The paths aren't but the grass was which causes cut offs. The tornado's fog effect was reduced. Some wall textured were changed. Sonic's statue is still using the dreamcast model. The shower room's textures were drastically changed. The 'SHOWER ROOM' sign is thicker and uses a texture instead of reflective letters. The lights around the lion aren't affected by fog in the GameCube version. In the ring vault a slope was changed into three steps. Sonic can no longer get into Knuckles' area. Upper walls in the main hall now have collision. The textures of the walls in Dilapidated Way were changed,the trash piles were made greener and the map was given a blue fog. The water is no longer green. Some of the walls on the SONIC Pinball table were changed. Sonic is no longer pinball-colored in neither the SONIC or NiGHTS table. The textures on the borders of the NiGHTS Pinball table were changed. The level was changed from Blue & Brown to White & Gray. The player's lighting is brighter. Act 2 has a slight gray fog. Big's Act is now at day. Tikal's hint is slightly higher in Big's Act. Act 1 has a blue design instead of a red one. The beginning and the end of Act 1 were given transparent ceilings. The tunnels on the cart track glow in the Dreamcast version. In the GameCube version, only a certain number of parts in them glow. The large pool area added an extra column. Less fog in Act 2. The stage loses the blue nighttime coloration it had in the Dreamcast version. The roads are gray instead of blue. Removed 2 circles of rings in Act 2. The howling wind keeps playing. Plants were given a updated model. Act 3 textures was drastically changed. Act 1 lighting seems darker. Act 2 has more fog and is less shiny. The eyes on the lava platforms in Act 2 do not glow in the GameCube version. Many textures were changed from yellow to blue. Due to the simplified lighting engine the effect where the stage gets darker when the ship rises is missing. The clouds that pass through the stage are stationary in the GameCube version. A slight gray fog was added. The entrance was changed from square to round. Most textures are barely changed from the dreamcast version. The walls of the rivulet are thicker in the GameCube version. The fog color changed noticeably; from a somewhat-blinding white in the Dreamcast version to a more subdued dark gray. The textures on the walls of various parts of the stage including the above image and the wall panel room in Act 2 were changed. The Dreamcast version maps a ground texture to bottomless pits, while the GameCube version uses a fog texture. An Egg keeper at the beginning was removed which was likely a mistake as it was restored in the PC version. Act 1 & 3 yellow elements was made darker. The out of bounds was removed to prevent the player from beating the stage in 5 seconds. The ceiling in the large vertical area in Act 2 was made entirely black. Strangely a invisible wall was removed at the beginning of Act 2. The water in Act 1 is brighter and less green. The center of the drainage room was given a border texture. Some red elements in Act 2 were changed to blue ones. Shadows are present along the walls of the stage in the GameCube version. The Egg Carrier doesn't appear in Act 1 due to the lack of a Z layering. The Egg Carrier has more of a shadow. Act 2 is slightly brighter. Sonic & Tails now use the DX models instead of their Sonic Jam models. The stage now has a green theme. The DLC courses weren't updated as they're unused due to the lack of internet. The City Hall Building was given a redesign. The other buildings were also given a redesign. You can see further in the garage in the dreamcast version. The reflections on the doors are differently arranged, but they depict the original Dreamcast colors, even on the GameCube version. The road was changed from dark blue to more realistic gray asphalt. Similarly, the yellowish sidewalk was changed to a duller gray. The walkway is less transparent and has less arch supports. Unlike other areas the casino and sidewalk use their dreamcast textures. The burger shop sign was changed. The reflections on the hotel doors (back) are darker in the GameCube version. A sign for "Ken's Play Room" was added next to the entrance to Casinopolis. The train that transports characters between Station Square and the Mystic Ruins is blue in Director's Cut instead of red. The water is now green. The large box texture was changed. The interior isn't dark at night. The interior and exterior was retextured. The area was given a more colorful appearance which is primarily blue. The area has a much brighter appearance. The folding palm trees lining Tails' runway are properly lit in the GameCube version. The walls in this area are lined with trees in the original game, but were removed for the GameCube version. The top of the walls surrounding the area were made more jagged. The paths can be seen through the canopy of the jungle. The water color is different. The glass tubes are brighter. The lower area is different. The Monorail station has a scrolling icon of the Monorail on its lights in the Dreamcast version. It was removed in the GameCube version. The color of the Monorail station's light on the exterior was changed from green to blue. Fog was added to the exterior area. For some reason a part of the chair was removed. The Living Quarters have some minor texture differences - one of the textures on the wall in the entrance area is upside-down, the color of the checkerboard texture on the rockets in the left room was changed from red to blue, and one of the textures on the ceiling of the room on the right was changed. The lights on the wall around the pool area are more rounded. The textures on the walls in the pool area were changed slightly. As you guessed the lighting is brighter. Fixed a bug where the "Hint Boxes" are purple. The glass is blue instead of green. The lights were changed from green to blue. Gamma's upgrade rooms have noticably different lighting. The Chao Garden warp room was given a number of texture changes. The Black Market from Sonic Adventure 2: Battle has been added to the Station Square Chao Garden. The game uses Sonic Adventure 2: Battle's advanced Chao raising system (it has on screen stats, petting, whistling). However, the Chao Doctor, Chao Kindergarten, and the Chao Karate minigame do not appear. Flat colored, shiny, and jewel Chao can be purchased, as well as special fruit. Seeds to plant in the Gardens do not exist, however. The Chao Transporter allows manual Chao naming, as well as Sonic Adventure 2's "Goodbye" feature. Chao can be seamlessly transported between Sonic Adventure 2: Battle and Sonic Adventure: DX. The Chao Stadium uses Sonic Adventure 2's music and GUI. The Chao Adventure VMU minigame was removed and instead replaced with a similar GBA connection feature (see below). You can also transfer one Chao from this game to Sonic Advance, Sonic Advance 2, and Sonic Pinball Party with the GCN-GBA Link Cable. The oval shaped painting of the sky was replaced with an actual window. The water area was changed. In the Dreamcast version, there are minor shallow pools with two quarter-temples hugging the corners of the walls. In the GameCube version, the shallow water is still there, but the quarter-temples have been replaced with a full temple in the middle, complete with a decorative fountain. The second set of doors for the entrance and chao race were removed. The chao face for the chao race entrance was replaced with text. The GameCube version added a sign to the "Chao Laboratory" website. A bridge and raised area were removed. An invisible wall was added to stop the player from jumping over the fence and dying. Lighting for evening and night was added. The evening and night skybox was changed. The water was lowered to try prevent Tails from drowning despite this it's still possible to drown. The water was lowered this enough to prevent the player from drowning and making it possible to grab chao floating. Removed a invisible wall making it possible to stand on the missile. A clear perimeter of the garden was added. In the Dreamcast version, the perimeter was only an invisible wall. Fixed a bug where chao sometimes don't spawn. All boss maps were updated to match the altered maps. Alot of textures were changed. It's easier to see the bottom of the lake. The pond is less green and more clear. The pond doesn't change to a "purified" texture when Chaos 4 isn't swimming in it. Chaos 6 is more opaque. The entire map was heavily revamped with different textures and buildings. Fixed an inconstancy where the poster shows an unused one. The Egg Walker is brighter. The hotel doors were strangely removed. The color scheme for the platforms and walls were swapped. The lighting was changed - ZERO and E-101mk.II are notably shinier. For a complete list of the game's production credits, please click the following link: Sonic Adventure DX: Director's Cut credits For a list of voice actors, see Sonic Adventure#Voice Actors.